Reno breast cancer survivor eyes a ‘walk for the roses’ – Each One. Tell One. 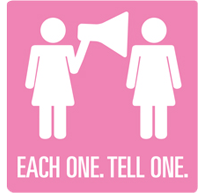 Reimer not only beat breast cancer, she is a founder of “Each One Tell One™,” a movement to educated women that screening with a Mammography may not be enough if they have the condition known as Dense Breast Tissue. Parade participants are selected via an online vote. Anyone who would like to vote for Reimer or view her profile can go to www.kentuckyderby.com/survivors. … The Sparks High School Friends and Alumni Association is taking nominations for the 2015 Sparks High School Hall of Fame. The deadline to submit a nomination is Feb. 23. For more information or to request a nomination for, call Edy Anderson at 626-0657. … Well done to the Hot August Nights Foundation for handing out more than 500 handmade scarves to the students of Lena Juniper Elementary School last Thursday. The charitable arm of the region’s largest special event works with knitting clubs year round to collect the scarves. They were handed out in time to give youngsters the opportunity to give them to a loved one for Valentine’s Day. … Nevada Newspaper Hall of Famer Sue Morrow celebrated her 83rd birthday on Valentine’s Day. Sue is still an eagle-eyed editor, as I can attest whenever I mess up something about her beloved Carson City. She’s also known to keep her neighbor, Bob Butler (of Butler Meats fame) on the straight and narrow. … Congratulations to former Nevada football coach Jerry Scattini who was recently named to the College of San Mateo Bulldogs Athletics Hall of Fame. … Reno’s Ben Manoukian recently completed quite an expedition in the outdoors of Wyoming and Utah. Taking the National Outdoor Leadership School’s Semester in the Rockies, Manoukian and his fellow students did a variety of hiking, climbing and cross country ski challenges. … The sixth annual Kurtis’ Angels F4K Fighting for Kurtis Margarita Tasting and Silent Auction is March 12 from 6-8:30 p.m. at Cantina Los Tres Hombres in Sparks. The event is a fundraiser for organ donor awareness through the nonprofit Organs ‘R’ Us. Tickets are $20. Go to www.kurtisangels.com for more information. … Macabee Office Solutions will be celebrating its 75th year in business in Nevada with an open house from 4 to 7 p.m. on Feb. 25. The event includes appetizers, drinks and a jazz trio at their showroom, 50 E. Greg St. RSVP to jmachabee@machabee.com if you’d like to attend. … Congratulations to UPS drivers David Codega of Sparks and Joseph Fleiner of Reno for their induction to the company’s Circle of Honor, an honorary organization for UPS drivers who have achieved 25 or more years of accident-free driving. Guy Clifton’s 3-dot column runs online and on Wednesday in the print edition of the RGJ. You can reach him at 775-788-6337 or email gclifton@rgj.com.